To obtain higher yields, the most productive indoor growers manipulate their plants into a low, wide and flat canopy with multiple flowering sites at the ‘same’ vertical height. This allows a larger proportion of your plant to bask in the “sweet zone” enjoying optimum light levels within a temperature range that is ideal for photosynthesis. 1. Topping is effectively used to obtain multiple, even-sized floral sites. 2. LST is then used to bring these floral sites to the same height to maximize grow lamp efficiency. STEP 1. Topping. When and how to ‘top’? Topping is best done when the plant is very young (less than 2-3 weeks old) and has only 2-5 nodes in total. 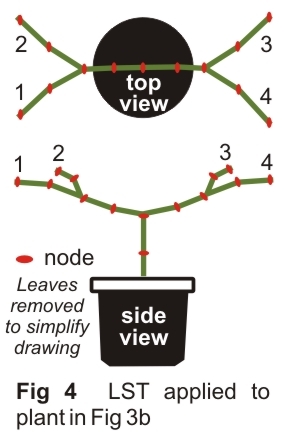 Topping is the removal of the plants ‘top’ growth just above a node (fig 2). Once topped, the two axillary buds immediately below the cut will then grow out into two new branches. 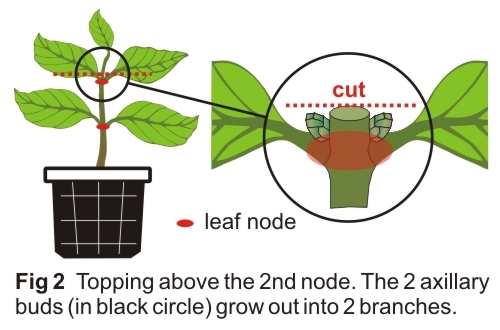 Once these new branches grow out to 1 or 2 leaf sets (or nodes) they can be topped again (Fig 3a). This second round of topping will grow out to form four even-sized branches (potential bud sites – see fig 3b). 1. Topping can be done more than twice however doing so will increase time in vegetative phase. 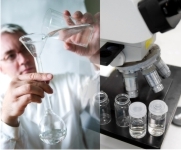 Test to see what is most productive. Some experienced growers will top up to 5 times (or more) to obtain 32 branches and can be well rewarded for their efforts. 2. Healthy plants usually take 2-3 days to recover from topping. After topping, do not remove the leaves from that node as these are needed to power growth of the branches from that node. Never top during flowering as it causes too much stress – which slows growth and inhibits yield. Do not top unhealthy plants. Also, avoid topping older, thicker growth as this takes longer to heal. 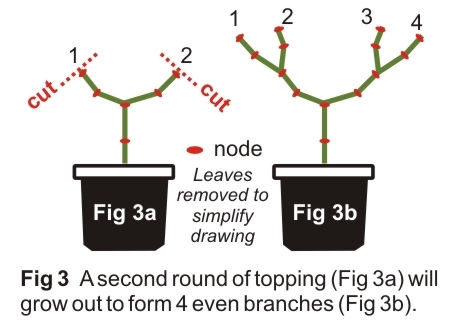 After topping (done twice in the scenario above – Fig 3b) there are four quality branches (or bud sites) growing vertically from what was originally the top node. LST involves pulling these branches downwards (to horizontal) and outwards (i.e. “star” configuration) so that all four branches are spread apart from one another, horizontal and at the same height (Fig 4). The lower branches from the nodes ‘below’ where topping occurred are now also closer and more exposed to the light. As these grow up they can be topped and manipulated using LST. 1. When to start and finish LST? LST should be started as soon as possible during the vegetative phase. Flowering phase can commence once all major branches are horizontal and level with each other. Budding can be triggered by switching lights to 12-on, 12-off. LST should continue during early flowering as vegetative growth continues. Maintain a flat, level branch structure. Vegetative growth will eventually stop when the plant is putting most of its energy into flowering. Minimal adjustment is required after this point – apart from keeping shade away from key areas. It can be beneficial to remove small, lower growth as this helps improve ventilation through the canopy and prevents infestations or infections due to foliage being in contact with soil. 2. Bending branches: Young growth is easier to bend than older growth. Also some species/ strains are easier than others. Do not rush to get branches horizontal, do this in stages. When a branch is first bent, growth will be slowed. Foliage will re-orientate towards the light then eventually start to grow. LST again once it grows another 3 inches or so. How to secure branches for LST? 1. Gardening wire or landscape stakes: This method is effective during the early growth stages soon after topping. Branches can be held in place with wire that is anchored to screws in the pot, or some other structure. As the plant grows the wires need to be tightened however ensure the main stem remains vertical. 2. Screen or netting: A square or rectangular frame needs to be securely erected with either netting stretched over it or create a grid pattern using string woven through eyelets that are screwed into the frame. The holes in the grid or netting need to be at least 2×2” or 5x5cm. 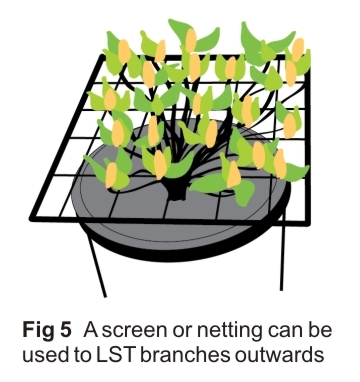 Depending upon the species, the screen is normally mounted low enough (approx 1-1 ½ ft / 30-45cm) from the plant’s base so all the lower branches can grow up to the screen and gain access to direct light (Fig 5). As the plant grows, the growing tips need to be lowered back under the netting and directed into the next empty space in the screen. Why do topping & LST impact the plant? In most species, the terminal bud or branch dominates growth to form a Christmas tree shaped plant. The growth of lateral stems and their floral sites is a lot slower than the terminal bud. 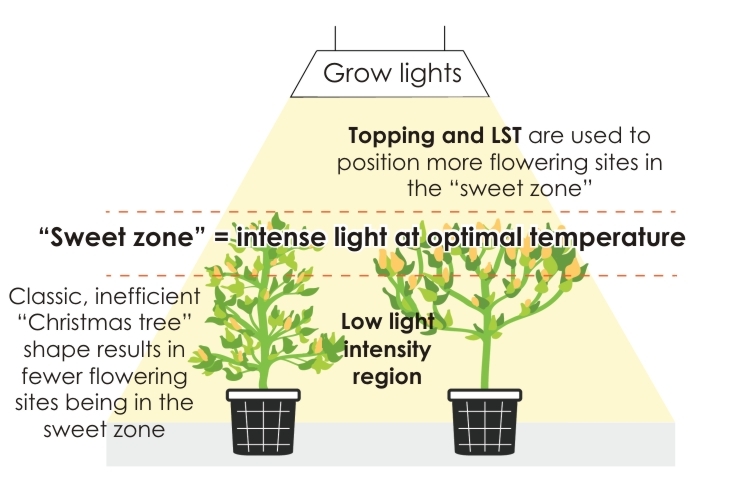 Topping & LST disrupts a plant’s hormones (auxins) which triggers the plant to “prioritize” growth more evenly to all nodes. Consequently lower branches will catch up to those higher on the plant and yield more bud sites and more evenly sized fruits. The plant also tends to grow bushier and shorter which is more suitable for indoor lighting.